When you hear "natural makeup" you may not think of anything particularly eye-catching. After today's Pure Puff post, hopefully you will think differently as we will be looking at some gorgeous products from Moody Sisters Natural Skincare. The Moody Sisters make everything from facial cleanser to bath bombs. Their products appeal to a wide variety of skin types and feature tempting scents such as Vanilla Chai, Lavender Rose, and Coconut Lime. Beyond their skincare line, they also have an array of natural makeup that is anything but ordinary. Today we will look at a gorgeous mineral eyeshadow, mineral blush and tinted lip balm. First, can we just admire the adorable packaging? I love their simple, yet artistic flair which is incorporated in all of their designs. I have always had a love-hate relationship with mineral makeup. I love the natural finish, versatile application, and color selection of many mineral products. What I hate... is the packaging. The Moody Sisters have restored my love of mineral makeup by featuring twisting dispensers that you can open just enough to release minimal product without making a mess. Never before have I considered traveling with mineral makeup, but thanks to this packaging, I just might! 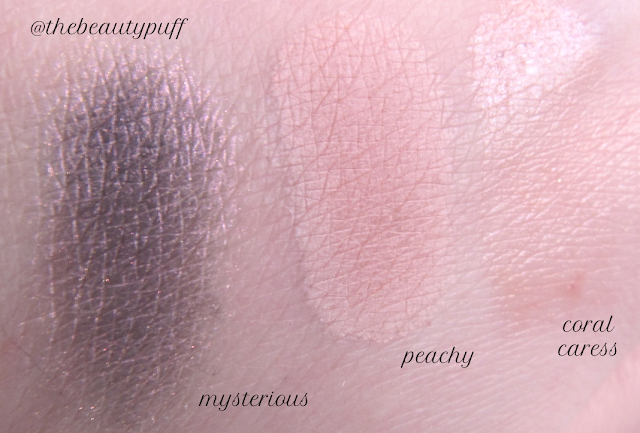 Mysterious is a unique shadow in that it looks gray, but has undertones of gold and purple so it almost transforms each time you wear it. When it hits the light I also see flecks of pink which really gives added dimension! (Yes, it is fun just staring at it in the mirror, I confess.) It is perfect for a one-shadow look with more concentrated application on the lid and blended out in the crease. You can even wet an angled liner brush to use it as a more intense liner. This technique can be used all over the lid as well to intensify the color for an evening out! Peachy is one of the smoothest, most pigmented mineral blushes I have ever used. The formula is fantastic and it applies like a dream. I LOVE this shade too. It's so versatile and it brightens up my complexion with no need for additional highlighting products even though it is a matte blush. I will wear this shade all year round for sure! The tinted lip balm is your typical twist-up tube, but is an oval shape which I thought was a unique feature. The balm is incredibly smooth and moisturizing and smells like vanilla frosting, yum! It is the perfect natural touch to finish off a sun-kissed look for summer without looking overdone. No mirrors or lip liner required with this one! It provides a touch of color that's perfect for travel or just in your purse. I am extremely impressed with the quality and pigmentation of these products. The instant I swatched them I immediately had to let the Moody Sisters know how much I loved them. If you are looking for quality, natural makeup, you really need to check out their incredible line of products. They even feature photos of their products applied and suggestions for how to wear them right on their site. And right now select lip balms are on sale and new email subscribers get 10% off plus a free sample! Be sure to check out www.moodysistersskincare.com and treat yourself with some naturally pretty products! *These products were sent to The Beauty Puff for review.